1.When changing the temperature range, the temperature indicator will automatically flash back forth until the adjusted temperature is reached. 2.The temperature must be at least two block(160/320F), the spray effect begin to work. 3.Remove the tank must disconnect the power supply the water tank is prohibited from immersion in water. 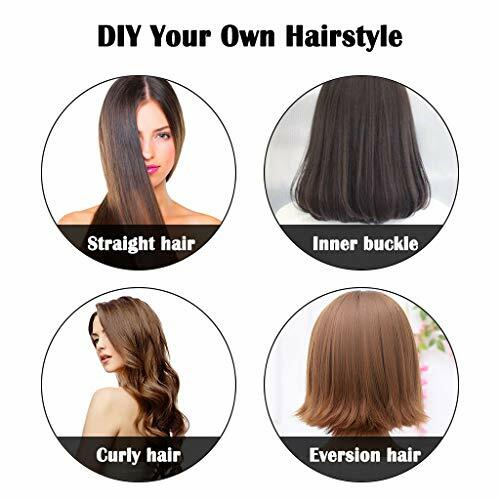 MULTIPLE USAGES:With 5 adjustable digital temperature control design(248F-392 F), whether it is wet dry hair, curly straight hair, you can make your own hairstyle as you like.Dripping essential oils into the water tank, hair care is done while making hairstyle. 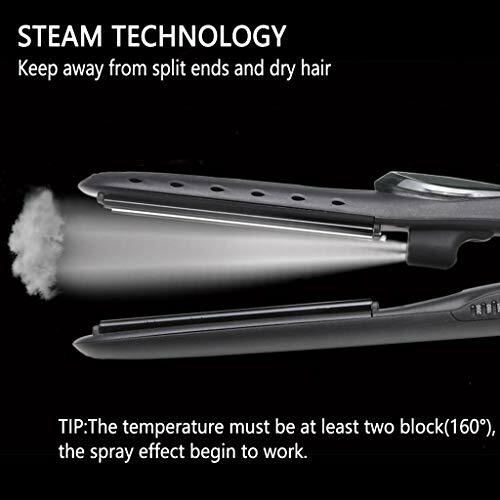 CONTROLLABLE FINE STEAM:Fill the removable water reservoir,point the steam hair straightener downward to activate steam function while holding hair taut between the plates.When close tightly glide across locks,you can feel the flow through the groove of the plates. DEVICE SMART FEATURES:The steam hair straightener is designed ceramic tourmaline plates, water dropper, removable water tank for easy refills, 60 minute auto shut off function,360 degree swivel cord, heat resistant rubber handle. PROFESSIONAL DAMAGE-FREE:The straightener is designed professional ceramic tourmaline plates(PTC heating) to straighten thick coarse hair without over drying the follicles,burning frying your hair.With tourmaline, it achieves ZERO sticking pulling. SAFE TIME-SAVING:Auto-shut off after 60 minutes of non-use automatic temperature lock for consistent heat when in use.With an extra safety glove can prevent accident happens when the temperature of the hair straightener rises rapidly. Dimension: 2.2 x 13.8 x 4 inchs., Weight: 1.1lbs.